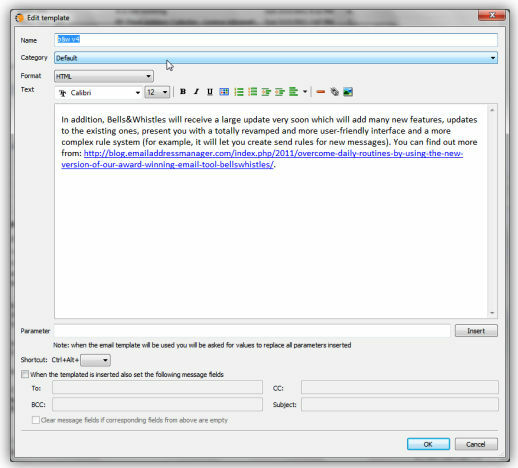 Create Outlook email templates for Outlook messages with Bells & Whistles. When you write a large number of emails, you are bound to be dealing with a large number of message patterns. As a result, several emails will end up containing the same text sections that you have to write over and over again. 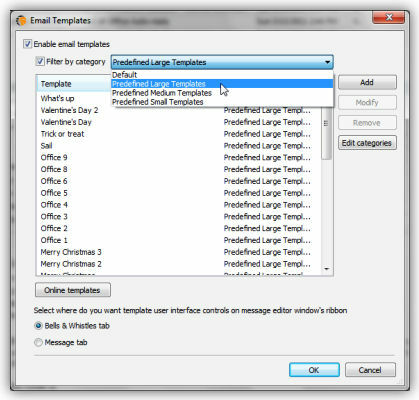 The goal of the Templates feature is to allow Outlook users to quickly insert blocks of text into email messages, without having to type that text over and over again. For example, if you work as a sales representative and you have to type the product payment terms over and over again for various customers, it would be a lot easier to simply define the payment terms as a text template and then to insert it into an email message with a single mouse click. The Templates tab can be accessed from the Bells & Whistles options window. By default, when Bells & Whistles is installed, the templates feature is enabled. Also, starting with v3 of Bells & Whistles, the program is delivered with over 30 predefined templates that are surely handy for sending nice emails to your friends & family. The predefined templates are grouped in three categories: small, medium and large templates. To make it easier for you to manage templates, Bells & Whistles allows you to create and manage template categories. This way, you can have a category for business templates and a different category for personal templates. The template editor allows you to create new templates for your emails. From the Templates tab, you can choose to add, modify or remove a template. The template editor interface depends on the template format type: HTML or plain text. We will further explain the usability of the HTML templates editor, as the plain text editor is very simple & straight forward. Moreover, once you define a HTML template, you can easily copy it as a plain text template, by clicking on the "Copy to plain text format" button displayed just below the HTML text editor frame. Not only that you can define templates for the email body content, but you can also attach other email properties to each template. For example, you can configure a template so it will automaticall fill the To, CC, BCC or Subject fields whenever the template is inserted. using the Insert button, you can insert the selected template into the email content. The template will be inserted exactly in the position where the text cursor is positioned within your email text content.